Last year I decided that a sailing holiday would be a great thing to try. I imagined it would be idyllic to sail around picturesque bays with a warm breeze at your back and new vista's constantly sliding into view. You're free to stop and explore wherever you wish and you're always off to somewhere new each day. It's convenient with your own food and accommodation readily at hand. There's also the exhiliration of a good sail and fun team work of running the yacht. Talking to various people and completing my RYA Competent Crew in August 2004 convinced me it was something I had to give a chance. I booked this holiday six months earlier while working towards my RYA Day Skipper qualification. With a holiday booked, it was imperative I finish the course. Well, in truth, it wasn't that critical since another couple were coming with us: Karen and James. Karen had just finished the RYA Yachtmaster qualification and James had plenty of dinghy sailing experience. Between the three of us, we would have no trouble sailing the yacht. After much research and consultation, we had settled on going the flotilla route. A flotilla gives you peace of mind that help is at hand if something goes wrong. It was our first charter for all of us so it just seemed the most practical thing to do. A flotilla doesn't mean you all follow each other; you just meet up at a common place at the end of each day. It took a long time to settle on the sailing area. Short haul to the Med made sense to keep costs down and flottila's are simply more popular in the region. Greece and Turkey were recommended as good sailing area's for beginners. We chose Turkey over Greece primarily because from our previous experiences, the food is better. Bodrum was easy to fly to and had a reputation for good consistent winds. So we settled on booking a flotilla out of Bodrum through Nautilus Yachting as they seemed to have a good reputation and the price was right. Our 40ft yacht for one week cost £1700 including all fee's, insurance and taxes. Nautilus is just a brokerage company. The yachting company we actually sailed with was Yildiz Yachting. On August 1st, 2005, the six of us flew out to Bodrum. K*'s right leg was broken and still in a cast but we hoped that wouldn't cause us too much difficulty. We arrived in Bodrum at 20:30 and caught our transfer to the marina. The airport transfer is a racket. Taxi drivers have grouped together and created political pressure to reduce the bus service. Our travel agent wanted £20 per person for the two way transfer for a total of £120 for all six of us. For a thirty minute transfer, it's outrageous. Through the Internet, I found a company, called Proper Car, that did it for £70 which is still too expensive in my books. Essentially, the airport transfer is a form of tourist tax. Anyway, we got to the marina by about 10:00 and found our yacht by ourselves since the Yildiz Yachting office was closed. Joining instructions were clear enough. 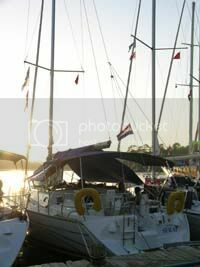 I was very pleased that the yacht was exactly as we were led to believe - a 2005 Sun Odyssey 40.3 named "Serap". I've read of lots of bait 'n' switch yacht charter horror stories and half-expected to get a different yacht. The yacht was immaculant. After checking out the yacht and unpacking our bags, we went out for a walk to get some water and money from a bank machine. It was very warm - low thirties - and despite it being late, there were plenty of people about. The marina was surrounded by nightclubs pumping out loud music but I didn't find it hard to fall asleep. We had our first briefing at 9:30. All together, there were 13 yachts in the flotilla ranging from 32ft to 44ft. Teddy and James were our flottila leaders. Teddy was a quite young and seemed pretty new to the job. He gave us the basic information we needed but he was downright uninspiring as a group leader. After the briefing, we trucked off to buy provisions for the week: wine, beer, water, melons, yoghurt, cheese, tomatoes, bread, olives, crisps, grapes, nectarines, honey, peppers, etc. The plan was to have simple cold foods for breakfast and lunch since for dinner, we would be mooring near restaurants. I sorted out some paperwork and then we had a technical briefing of the yacht. Nothing really surprising as we were shown where everything was. It was all clean, tidy and new. 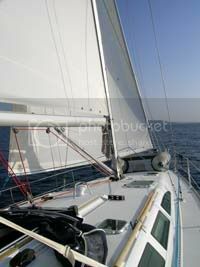 The yacht was well equipped: furling genoa, furling main, GPS, autopilot, holding tanks, etc. With Karen as the official skipper of the day, we soon slipped our mooring lines and headed out. The wind was gusting around force 5 so it was going to be a good sail. We only put up sails to the third reef with the idea of keeping the sailing gentle for Jenny and the kids. This was, after all, their first real experience of sailing. So why, you may wonder, did R* shout "this is the WoRST HOLIDAY EVER!!" only a few hours later? Well, it started well as we sailed around Karaada Island but our passage took us on a long run/broad reach across the Bay of Gokova to Kormen. The wind started gusting up to force 7 and the swell got up to two metres in height. The resulting rolling corkscrew motion of the boat soon had R* feeling sick and she threw up into a plastic bag. Minutes later, Jenny violently threw up into the same bag before R* could move away. Not all of contents of Jenny's stomach made it into the bag. Hence, R* got a bit upset. I was a bit worried that this was not a good start but was still hopeful that we had six more days to prove that sailing was fun and to get the crew ship shape. Soon K* wasn't feelin well either but he never threw up. We made it inside the man-made harbour of Kormen and the boat finally stopped rolling making everyone felt much better. There is nothing at Kormen except the little harbour and one fish restaurant. It's really just a place for the ferry from Bodrum to land. R* tried her luck at a bit of fishing and we ate dinner at the pleasant restaurant. Despite the strong wind whistling through the shrouds and backstays, I found the air stifling in the yacht. It was hard to sleep in the cramped stern cabin. Today was my turn to be skipper. Again, we had our uninspiring briefing at 9:30 followed by a simple breakfast before setting off. With a decent breeze off our stern, we had a good run down the coast heading for Amazon Creek. 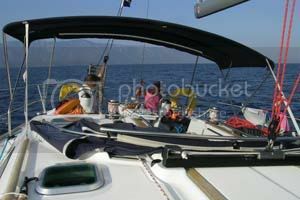 Jenny and the kids had learned not to go down below into the cabin while sailing and to look out towards the horizon. We had lunch enroute but Jenny quietly lost hers later that afternoon. Oh dear! We rafted late that afternoon at Amazon Creek with the rest of the flottila. I swam a stern line ashore and then stayed in the water to snorkell. Everyone went swimming except for K* who had to avoid getting his cast wet. R* didn't like the salt water and quickly got out. Later on, she rowed around the flotilla raft in the tender. That evening, we used to the tender to get ashore and walk down to the restaurant at the nearby holiday camp. The holiday camp had a pool so R* spent most of the evening splashing about in it. The night was much cooler and it was easier to sleep. No wind! 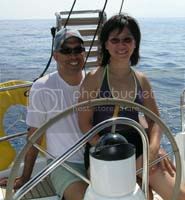 With Karen as skipper, we motored down the coast looking for a nice place to moor and swim. Amongst Seven Islands (Yedi Adalari), we found a nice sheltered bay at East Creek. Karen saw something large and black jump out of the water but none of us saw it again. We were hoping to encounter some dolphins. A couple of other yachts were also in the bay with the same idea of having a long lazy lunch and swim. Some Turkish children in a speedboat found us and sold us some expensive ice creams. Very entrepreneurial. With the afternoon getting on, we motored out of the bay to find that the wind had picked up. We had a great sail to English Harbour (Degirmen Buku) with a force 5 wind off our beam. It's known as English Harbour as some British torpedo boats hid here during WWII. We rounded a point with a statue of a mermaid and prepared to moor on the jetty. Unfortunately, James lost a T-shirt over the side by not holding it before removing the clothes pegs. Oops! It sunk within seconds. Upon mooring we put up a bimini to shade the deck. It helped keep the boat much cooler. English Harbour is an beautiful location. Pines covered the surrounding hills which snuggled around the bay. A few Turkish gullets were also moored up. The restaurant was good but extremely slow. I was skipper again. At the briefing we learned that we were to moor up back at East Creek for the evening. However, we could embark on a sailing excursion to Snake and Castle Island before going back to East Creek. After breakfast we set off with a good breeze from the West. Didn't take long to get to the tiny islands. Castle island was only maybe ten acres all together. It has a beach called "Cleopatra" beach which is popular with day tripper. It was supposedly made by Cleopatra on one of her journeys for the benefit of Mark Anthony. We circumnaviagted the island and decided to moor free swinging just off the south shore well away from the crowds. We had our lunch and afterwards, Karen, James and I swam to the island and had a look about. There was a remarkable amphitheatre and the ruins of a walled settlement. It was all part of the ancient town of Cedrae. We swam back to the yacht and Jenny joined us in the water. James towed the kids about in the tender since R* didn't want to get in the water and K* couldn't. We left around 3:30 to get back to East Creek beating upwind in a force 5/6 wind. The sailing was excellent but progress was slow. While adjusting the mainsail, the kicker broke. So much for a new yacht! The lug on the mast had broken. Luckily, we had Karen who pulled out her trusty Leatherman and fixed it onto a spare lug. But by about 5:00 we had to furl the sails and start motoring just to get back in time. We were the last yacht to join the flotilla raft at 7:00. The sun sets at 8pm. There's no restaurant in East Creek so Jenny had a go at cooking in the galley. Jenny made pasta and tuna, cheese rolls and a watermelon salad. It was excellent but boy did it ever get hot in the cabin! That night, we lowered the bimini that covered the pushpit and enjoyed a spectacular night sky complete with shooting stars. James was skipper today and the brief was to cross over the Bay to the northern shore and raft up in Cokertme. The wind was between a force 2 and 4 coming out of the West. With no where to stop, we just set the sails for a close haul and headed across. There weren't any interesting bays on the other side so by 2:30 we were rafted up in Cokertme in a hefty swell. Jenny didn't look to well but held up. Sleepy from beer and the rocking, we had a lazy afternoon chilling out. It wasn't an attractive place to swim. Some speedboats ferried us to Kaptain Imbrahims Restaurant that night where they had live music and put on a bit of a show. Very touristy. Luckily the sea calmed down that evening and we had a good sleep. I was the nominal skipper again for the easy sail home. We motored up the coast at Pukuc and moored free swinging in the middle of the bay for lunch. Enroute, I spotted three dolphins that breached the surface just in front of our bow but they didn't stick around. Too bad. I was the only one who saw them. We had a our lunch and then about 2pm the wind had picked up and we headed out to do a last bit of sailing before going back to Bodrum. We all took turns trying a man-overboard drill rescuing a buoy under sail only. Jenny and James did well considering it was their very first attempt at the exercise. We were due back in Bodrum by 4pm so is wasn't long before we had to start sailing back. We got up to 6.5 knots and became a bit competitive with a yacht that was sailing close to us. Yeah, I think it would be fun to try yacht racing one day. In Bodrum Marina, I got some practice with some tight manuevering. We filled up with diesel and moored up for the last time. In one week, we had only used 36 litres of diesel in the 120 miles we had covered. That evening, everyone on the flotilla met one last time for a meal at a nearby restaurant. Over the week we had all had various chit-chats with others on the flotilla but in generally people kept to themselves. There were several other children but all of them were older than ours except for one German girl who was R*'s age. They never befriended each other. My one main criticism of the holiday is that the flotilla leaders made no effort to circulate around the group, introduce people or organise anything beyond the evening meal. They could have done a much better job. We were off the boat by 10am and spent most of the day hanging around a pool at a nearby hotel. Jenny, Karen and James did a spot of shopping while I looked after the kids. Later that evening, our 21:30 flight home got canceled so we arrived back in Bodrum around midnight. At least we were put up in a very nice five star hotel. Got a wake-up call at 4:45am and we again went to the airport where we managed to catch a flight home. While the start of the holiday was a bit rough, everyone agreed it was good fun in the end. The flotilla leaders were rubbish but we didn't really need them. What would have been nice is some good sandy beaches for the children to play on and some interesting excursions ashore. More marine life or interesting places to snorkel would really make it great. So a sailing holiday is a excellent way to spend a vacation. I wouldn't hesitate doing it again although I'd be choosy about the sailing area and itinerary. In fact, I'm already looking into it! By the way, K* got around the yacht just fine with his leg cast. No problem at all! Hi there, I've read about your wonderful sailing experience in Turkey last year. Even if chartering the boat is not of interest to you, stop by sometime for coffee if are ever in Bodrum.. you are more than welcome.. My boat is located in Torba-Bodrum-Turkey. Please feel free to share this message with any friends who you think might be interested. 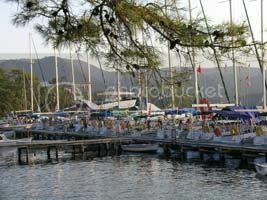 Thanks, and happy new year..
New to sailing and on our most recent flot holiday we sailed north west out of a marina called Turkertrese sailing into Torba en-route. We live in the uk and realise it doesn't make very much sense having a boat here (Brighton)as there aren't the places to sail to close by! How feasible for a first timer would it be to buy a boat in the Torba Bodrum area? We are looking to retire in the next six years when we can leave the business and take time out! I'm planing to sail the same route you did (almost). For the past years I sailed flotilas so I understand your dissapointment about the flottila leader. Since we sailed with Sun Sail a large and well known company they had a crew of 3. The third person was in charge of organising the fun. We had a barbeque on the last evening too.